For this month’s can jam the theme is Herbs! tigress and the awesome food in jars lady picked this out for us, and yet again it is a challenge. Challenge narrowing down the choices that is. I adore herbs, I would be hard pressed to select my favorite, but my favorite(s) usually involve tomato sauce, it is the Italian in me that screams for the red. And it is so not tomato season yet – so I will have to wait. Once again I find myself turning to my hubster for inspiration. Out of nowhere I ask him “What’s your favorite herb?”. Accustomed to these sort of non sequiturs from me he takes it in stride. After some thought he says “Mint”. Spring is Green, Green is Spring! I went through a phase last fall where I was obsessed with the idea of herb jellies. Where most canning recipes are adamant about following them exactly or oh my GOD you are going to kill your friends and family with the BOTULISM and they will put you in canning JAIL, the herb jelly recipes actually encourage playing a little fast and loose with the ingredients. And what encourages more fastness and looseness than RUM*? The Hardware: see The Canning Thing, makes 4 half pints with a little left over – so if you have a 1/4 pint jar it would be a good thing, strainer & coffee filter. Combine3/4 C water with 1/2 C rum in a large saucepan. Add in mint. 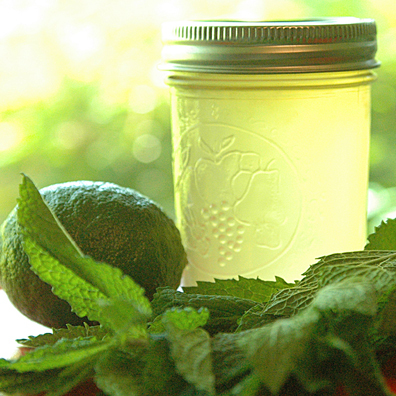 The original recipe called for 2 T of mint – and really who the heck are they kidding? I bought a big bunch and pulled the leaves off and threw them in the pot until it looked like enough. And for me “enough” was so that I pretty much couldn’t see the liquid any more, I figure it was probably a loosely packed 1/2 C or tightly packed 1/4 C. Put in enough to get your mojo working. Bring to a boil and then turn the heat off. Cover and allow to steep for awhile. The original recipe said 5 minutes – I am guessing I gave it 20. Put your strainer over a liquid measure and line with your coffee filter, pour in mixture and allow to drain. Pick up the filter and squeeze gently to get all of the liquid out and discard the filter. Measure out 1 C of the mint infused liquid and put in a large non-reactive cooking pot on the stove. I am going to assume that you already squoozed your limes – I nuked mine for 30 seconds to get more juice out of them. Add all of the other ingredients except the liquid pectin to the pot and crank up the heat. Stir pretty much constantly until you reach a full rolling boil that cannot be stirred down. That is totally “jamming” speak and what it means is the stuff is going to foam up like boiling lava and unless you stir it like the bejeebus it is going to overflow your pot and turn your range into a disaster area. That is why you need a big pot. Way bigger than you ever think you could possibly need. Once you have reached the “full rolling boil” dump in the entire pack of liquid pectin. If you haven’t used liquid pectin before – here is a trick. Have a short glass that the pouch fits in sitting beside the stove. Cut the top all the way off before you get started and set it in the glass so it doesn’t tump over. Now you can just pick it up and squeeze it in without fiddling with anything because hey, molten lava sugar is not the time go dinking around with your pectin packet. The pectin will knock back your boil, but keep on stirring – it will revive shortly and shut down European air space. Once you have regained FRB set a timer for 1 minute and maintain FRB while stirring for 1 full minute. Then turn off the heat. Do the canning thing and fill your jars with the goodness. Leave 1/4 inch headspace and BWB for 10 minutes – adjusted for your altitude. It takes 15 at my house, your house may vary. I am pretty sure I left out 1/2 C of sugar in my measuring. I was lazy and measured directly into the pot, which is like measuring salt over your mixing bowl while baking. DON’T DO IT, IT’S STUPID! I think I lost count and missed a 1/2 cup somewheres. We will see how well the jellies set and that might let me know. The thing that makes me really think I whoopsed it is that I ended up with 4 half pints plus about 3/8 of an inch in a 5th jar. The recipe said it would make 4 half pints and a quarter pint – and this book is usually spot on the mark with quantities. Regardless of the renegade sugar, since I had the small amount left I was able to taste the jelly straight away. And it was tasty, refreshing even. I think the rum played a background part and the balance of the mint and lime is really nice. When I make this again I might swap the quantities of water and rum and see what happens (btw, I checked and rum has a ph level considerably lower than water so I didn’t hose anything with the substitution), it might even be possible to leave the water out altogether. But I am not sure that would be a good idea – who knows? After I finished canning I took the leftover jar down to the hubster with a little tasting spoon, he said he liked it. I had to run out the door and pick up my little man from pre-school and when I returned the leftover jar was in the sink with the spoon – empty. Which I will take to imply he wasn’t lying. He ate it all, with a spoon. For full disclosure – I am not much of a drinker and have never tasted a Mojito. I have no idea if this jelly tastes anything like a Mojito – one of you boozers will have try it and tell me how they compare. So, do you have a favorite cocktail that we could jellyfy? *Arguably one could say Tequilia, but we do not keep that in the house.